"Jay Rockefeller first arrived in West Virginia as a young volunteer, eager to improve the lives of working families. And for more than four decades, he has continued to fight tirelessly on their behalf. From his time in the state legislature to the Governor’s office to the Senate floor, Jay has built an impressive legacy, one that can be found in the children who have better schools, the miners who have safer working conditions, the seniors who have retired with greater dignity, and the new industries that he helped bring to West Virginia. A long-time champion of health care reform, Jay was also instrumental in the fight to make sure that nobody in America has to go broke because they get sick. Michelle and I join the people of West Virginia in thanking Senator Rockefeller for a lifetime of service, and I look forward to continuing to work with him over the next two years." ALERT - Speaker Boehner: American people will not tolerate an increase in the debt limit without spending cuts and reforms. President Barack Obama warned Congress on Monday that a refusal to raise the U.S. debt ceiling next month would trigger economic chaos. Obama, at a news conference, said the U.S. economy was poised for a good year as long as Washington politics did not interfere. He said a Republican refusal to lift the debt ceiling could lead the United States into a debt default, which would prevent the U.S. government from being able to provide Social Security benefits to some seniors and possibly tip the economy into recession. "It would be a self-inflicted wound on the economy," Obama said. Reuters: U.S. House Speaker Boehner repeats that debt ceiling increase must be accompanied by deficit reduction. Boehner adds that the House will pass legislation to control spending, meet U.S. "obligations" and keep the "government running." Former President George H.W. Bush may go home on Monday from the Houston hospital where he has been since November, a spokesman said. "That's what we hope - awaiting final word from the doctors if it will be today or tomorrow," family spokesman Jim McGrath said in an email on Monday. One of Bush's sons, former Florida Governor Jeb Bush, said on Saturday that his father was expected to be released from the hospital on Monday, according to TCPalm.com. Senate Republican leader Mitch McConnell said on Monday he thinks that 10,000 U.S. troops should remain in Afghanistan after 2014, when President Barack Obama wants to withdraw most combat troops. McConnell has just finished a visit to Afghanistan with a small group of his fellow Republican senators, his seventh trip there in the past decade. "I think we're going to need a minimum of about 10,000 troops here to provide adequate training and counterterrorism in the post-2014 period. And we anticipate there'll be forces from other countries who will remain here beyond 2014 as well," McConnell told reporters on a conference call during a stop in Italy after leaving Afghanistan. Nat'l Rifle Assoc: "The NRA and our New York members are outraged at the draconian gun control bill that was rushed through the process." Video: Frontline documentary "Inside Obama's Presidency"
• Obama proposes program to allow schools to hire 1,000 "school resource officers"
Fiscal showdown(s): From surprise presser to temporary deal. President Obama held a news conference on short notice Monday morning (full video here), standing firm on his refusal to trade spending cuts for raising the debt ceiling, as proposed by Speaker of the House Boehner and congressional Republicans. Obama insisted that he would not negotiate on this front given the risk of economic chaos from a failure to act - though he added levity by acknowledging that he might welcome more friendly socializing in the White House. On Friday, Republican leaders said they would seek to raise the debt ceiling for three months without accompanying cuts, providing a way to seek other concessions and refine a fiscal strategy in the interim. Squint and look further ahead with this National Journal piece on looming fiscal strife. Gun control: Ideas, proposals and action, with many battles ahead. The gun violence task force led by Vice President Biden that was set up after the Newtown school shooting presented its proposals to President Obama after last week's high-profile meetings with interest groups. New York state passed a landmark gun control bill on Tuesday (Massachusetts may follow soon) that was denounced by the NRA, which released a controversial ad centered on the Secret Service protection for Obama's children that was in turn denounced by the White House. Against this backdrop, Obama and Biden announced (video)the details Wednesday of the biggest gun-control push in decades, including background checks, an assault weapons ban, and 23 executive actions to be taken without congressional approval. The NRA attacked the announcement as misguided, and the legislative path of the plan is sure to be rocky. The second term: Setting the stage. The mandated January 20th inauguration day falls on Sunday this year, so Obama will be officially sworn in during a closed ceremony with a well-practiced Chief Justice John Roberts. A public swearing-in will follow on Monday the 21st. Though this inauguration will be subdued compared to four years ago, it will still attract hundreds of thousands and feature a challenging inaugural address that, along with the February 12th State of the Union, will attempt to situate Obama's second term. The new Cabinet is also taking shape, with the announcement of Interior Secretary Salazar's departure and the January 24th and 31st confirmation hearings, respectively, for Chuck Hagel as defense secretary and John Kerry as secretary of state (with questions following Hillary Clinton out the door). Also: Former President George H. W. Bush was released from his lengthy hospital stay. Secretary of State Hillary Clinton was scheduled to testify on January 23rd before the House Foreign Affairs Committee about the Benghazi attack. The House approved the main $50.4 billion portion of the Sandy disaster relief package. And Obama's half-brother in Kenya has been inspired to seek elected office himself, as has Stephen Colbert's sister. WASHINGTON, Jan 23 (Reuters) - Secretary of State Hillary Clinton choked up on Wednesday as she defended her handling of the Sept. 11 attack on the U.S. mission in the Libyan city of Benghazi, an event that threatens to stain her legacy and any presidential hopes she may still harbor. 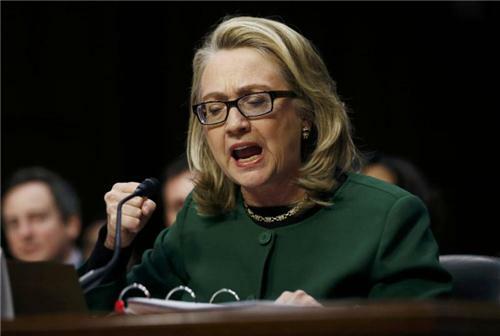 By turns emotional and feisty, Clinton told U.S. lawmakers that she took responsibility for the incident in which U.S. Ambassador Christopher Stevens and three other Americans were killed, but also defended herself. Clinton: "Four years ago, al Shabab was one of the biggest threats to East Africa ... It took American money, American know-how, and American experience, and we have to make the decision we're going to do the same in North Africa as well." Sen. John McCain disagrees with Secy. Clinton's characterization of what the U.S. did in Libya: "We did not help them with border security, we did not give them the kind of assistance that would be necessary to help dismantle the militia." "I understand your very strong feelings," Clinton tells McCain who scorched her on Benghazi at Senate hearing "We just have a disagreement." Secretary of State Hillary Clinton defends her handling of the attack on a U.S. mission in Benghazi that killed four Americans. Rough Cut (no reporter narration). Sen. Rand Paul lays in to Secretary Clinton, calling the Benghazi attack the "worst tragedy since 9/11" and calling Clinton's handling of the attack a "failure of leadership." The Senate will take up a nearly four-month extension of U.S. borrowing authority if the Republican proposal is passed by the House of Representatives, Senate Majority Leader Harry Reid, a Democrat, said on Wednesday. Senate Democratic leaders, unlike their House counterparts, praised the legislation, saying that it would cut the link Republicans had previously insisted upon between future debt limit increases and new spending cuts. The House is poised to vote on the legislation on Wednesday. WASHINGTON - Senator John Kerry received backslaps and lavish praise from his Senate colleagues at a hearing on Thursday that left little doubt he will win easy confirmation as secretary of state. Appearing before the Senate Foreign Relations Committee which he has chaired for the last four years, the five-term senator from Massachusetts and Vietnam War veteran was praised by Democrats and Republicans alike. Graham ("uncharacteristically absent from this gathering"). McCain emphasizes importance of technology as part of border security / enforcement part of proposal, including UAVs (unmanned aerial vehicles) and radar, mentions importance of this issue in his home state of Arizona. McCain on immigrants currently in U.S. illegally: "I think everyone agrees that it's not been beneficial to our country to have these people here, hiding in the shadows." Senators not present who are in the so called "Immigration Gang of 8" are Flake (R-AZ), Graham (R-SC), Bennet (D-CO). Full rundown of the group here from the Washington Post. Menendez says proposal's road to citizenship for immigrants in the U.S. illegally "will be an arduous one, but a fair one." Menendez offers remarks in Spanish to end his portion of the press conference. ... And Rubio takes the podium, joking to McCain that he "doesn't agree with anything Bob just said about you in Spanish." Rubio also closes his brief remarks in Spanish, references his family's history of immigrantion to the United States.